ADR rising and so does the price — healthy trend. ADR falling and so does the price — healthy trend. ADR reading diverge from the price — trend may change. ADR crossing above 1.00 level — an uptrend has been established. ADR crossing below 1.00 level — a downtrend has been established. The further ADR moves from 1.00 level the more mature current trend is. Advance Decline Ratio in Forex determines a momentum in the market by comparing advancing moments to declining ones. A/D Ratio was brought from stock trading, where traders were calculating the difference between stocks listed on the New York Stock Exchange that advanced in price minus those that declined. If ADR is less than 1 it means that there is more declining moments than advancing. If ADR is higher than 1 – advancing moments prevail. Advancing moments - the number of bars that closed above their opening price. Declining moments - the number of bars that closed below their opening price. ADR indicator is used widely as a overbought / oversold indicator where extremely high reading suggest the market being overbought while extremely low readings suggest an oversold market. However, the market can remain in overbought/-sold condition for an extensive period of time, therefore an additional confirmation signal from other tools is needed to confirm a move. Similar to all other momentum indicators the cross of 1.00 level on ADR indicator is an important signal of an established trend while the distance from this 1.00 level describes maturity of the trend. On a Forex chart Advance Decline Ratio (ADR) indicator looks more like Advance Decline Line (ADL), but in contrast to ADL, ADR cannot be negative. Let’s take a down trending market. By looking at ADR traders can measure a strength and health of a current down trend. If ADR is low and decreasing during the sell off it indicates a good health of the downtrend. If, however, ADR moves higher while the trend continues down, it suggest a deteriorating strength of a trend, in other words with each downside progress fewer participants take part in driving prices down. 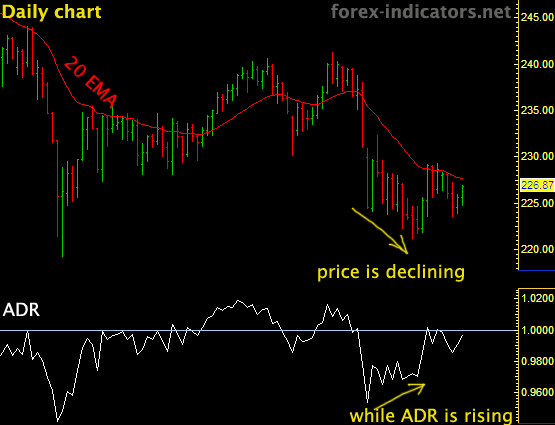 Eventually the market is going to change the direction and move higher following ADR indicator. Sincerely I applaud your website & all detailed information therein. Please answer to the above comment i.e. How do you use this indicator? What settings do you prefer? I be pleased you do justice to this question & do counsel novice traders the basic indicators they should adhere to always as well as time-frame too. This indicator comes as is from a broker, no inputs, no additional settings. I've described the ways to use ADR above. If I discover anything new, I'll be glad to add it to this page. I don't have ADR indicator for MT4, I'm sorry. I don't have ADR for MT4, sorry. Huge thank you to the Trader who shared it!